Commander Shanti Sethi is a native of Reno, Nevada. She graduated from Norwich University in 1993 with a degree in International Affairs. She also holds a Masters of International Policy and Practice from The George Washington University. CDR Sethi served on USS BUTTE (AE 27) from March 1994 to June of 1996. While on board she served as Communications Officer and Electrical Officer, making a Mediterranean/Arabian Gulf deployment in support of Operations Deny Flight, Sharp Guard, and Southern Watch. After BUTTE’s decommissioning, she served as Navigator onboard USS HOPPER (DDG 70), where she made a Middle East Force deployment in support of Operation Southern Watch. She reported to USS HIGGINS (DDG 76) in March of 2001, serving as the Weapons Officer until November of 2001, then as Combat Systems Officer. On HIGGINS, she completed an Arabian Gulf deployment in support of Operations Enduring Freedom and Iraqi Freedom. In May 2003, she participated in the first DDG Sea Swap, serving as Combat Systems Officer onboard USS BENFOLD (DDG 65) until her departure in November 2003. She assumed command of MHC Crew BOLD, embarked in USS BLACK HAWK and USS HERON in April 2004. After turning HERON over to the Hellenic Navy, she assumed command of MHC Crew DETECTOR, embarked in USS KINGFISHER. CDR Sethi’s shore tours include the United States Naval Academy, the Navy Surface Warfare Directorate and the Navy Office of Legislative Affairs. She assumed command of USS DECATUR (DDG 73) on 15 December 2010. CDR Sethi’s decorations and awards include the Meritorious Service Medal (two awards), Navy Commendation Medal (four awards), the Navy Achievement Medal, and various unit and campaign awards. Pacific/Arabian Gulf (2011) - USS DECATUR (DDG 73) during their Western Pacific/Arabian Gulf deployment. An Arleigh Burke Class Destroyer (Ballistic Missile Defense ship) home ported out of San Diego, California. SAN DIEGO - Arleigh Burke-class guided-missile destroyer USS Decatur (DDG 73) returned to San Diego, Calif., after completing a seven-month deployment to the Western Pacific and U.S. Central Command area of responsibility (AOR) April 21. CHENNAI, India (March 17, 2011) - Cmdr. Shanti Sethi, commanding officer of the Arleigh Burke-class guided-missile destroyer USS Decatur (DDG 73) answers question from female students from various city colleges and high schools to commemorate Women's History Month. 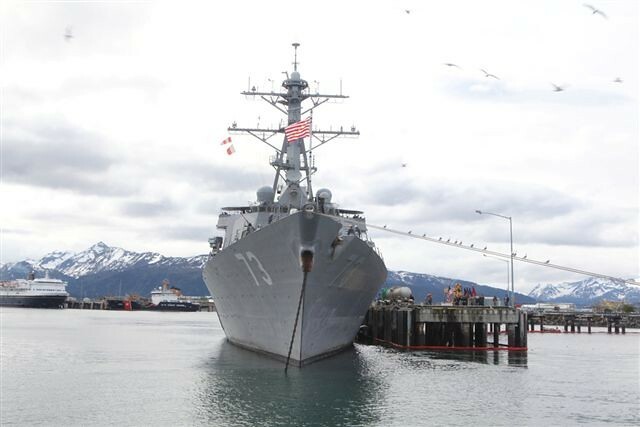 HOMER, Alaska - The USS Decatur (DDG-73) sits docked in Homer, Alaska, before the start of Exercise Northern Edge '11, June 12, 2011. 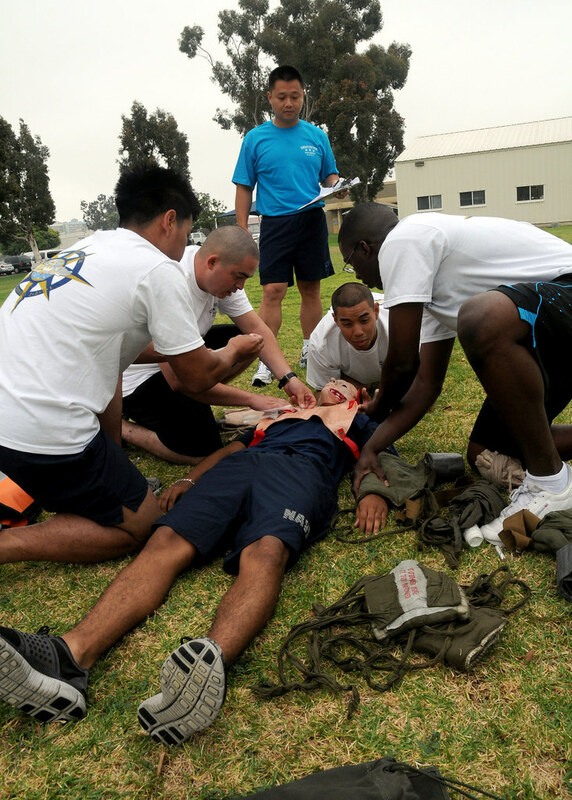 Sailors from USS Decatur (DDG 73) compete in the stretcher bearer competition for Surface Line Week on Naval Base San Diego.